Not all hummingbirds are wildly colorful, not even all adult males. 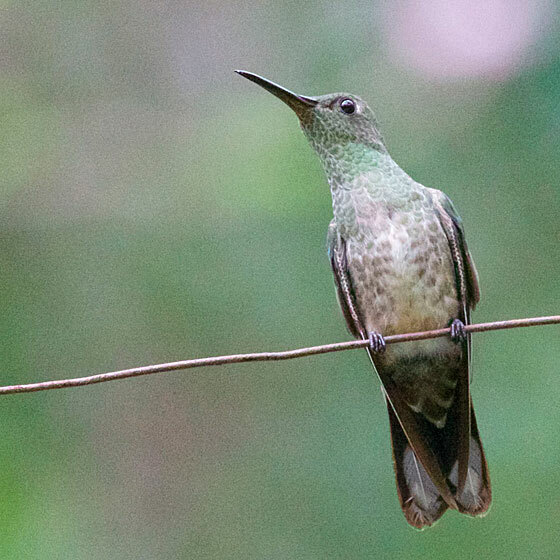 I saw a Scaly-throated Hummingbird in Honduras, but just once. All of us on the trip prized this rarer hummingbird, and not only because it was less easily seen. It has a subtle beauty, don't you think? It does appear almost as if it has scales on its throat and breast. I wish I could watch it longer. I wonder what the male hummingbird does to wow the female. Does he sing? Does he dance on air? Or does the female simply appreciate his softly colored, muted, mottled vest? The best binoculars in the world are useless if you left them home because they were too heavy. Pocket binoculars to the rescue! Here is an overview of pocket binoculars at a wide variety of prices. Some are so lightweight they feel like you're not carrying anything at all.